Wedding flowers, beside other details that complete the atmosphere of a dream-like wedding celebration, are the elements that give brightness, cheerfulness, and freshness to the ambient. Choosing the right flowers is, indeed a difficult task, as there is a whole variety of types, colors, shapes, and symbols to come with the definition of flower. To make the choosing task easier, wedding couples should consider the aspects of their wedding ceremony that have to follow the same line with the selected flowers. Once the couple has decided on the theme of the wedding party, on what outfit matches the theme, on what location and room the party is taking place, it is good for them to take a look at the symbolism of the flowers. There are plenty of written notes, either in specialty books or in the Internet sites, which describe the meaning of the flowers, even the etymology of the word that originally stood at the given name of the flower. According to these helpful hints the couple would be easier to select and, after checking with their wedding budget, to set out and order for the desired flowers. 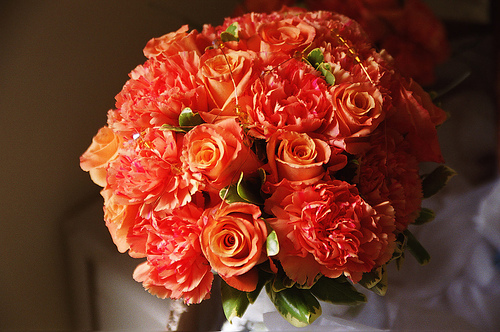 Some of the favorite flowers for the weddings are roses and carnations. Roses come in different colors, each of it meaning something different than the other. For instance, pink rose means friendship, admiration, happiness; red rose – passionate love, prosperity, purity. White rose – purity, and generally white flowers are related to new beginnings and make an perfect match with the first-time bride walking down the aisle. Yellow rose bear the feeling of exuberance, evoking the sun color, therefore its warmth and welcoming; lavender rose – has the message of a love at first sight. There is also color for roses that is not offered to us naturally, the blue color. The blue roses are very elegant and represent the mysterious and unattainable. Roses look beautiful and have been used for ages during wedding ceremonies. The bouquets and the decorations enriched with roses has been and will always be a perfect choice for the wedding celebrations. Whenever a rose is present, its effect can never fail. Another popular choice of wedding flowers is carnations. Beside the fact that they look pretty, they are also preferred because they can line up with a limited budget of a wedding. And another aspect not less important, is that carnations, by structure last longer than any other flower. The etymology of the name brings the translation of a carnation into “flower of love” and “flower of the gods”. They come also in a vast variety of colors and versatility. Generally speaking, carnations symbolize divine love, distinction, and fascination. White carnation – symbolizes innocence, sweetness, remembrance, and passionate love; light red carnation – symbolizes admiration and the pink ones are often offered as a sign of gratitude; yellow and striped carnations though, are better to be avoided as lovely as they are, because they symbolize refusal and disappointment. Carnations represent a good choice for boutonnieres as they do not die so fast.